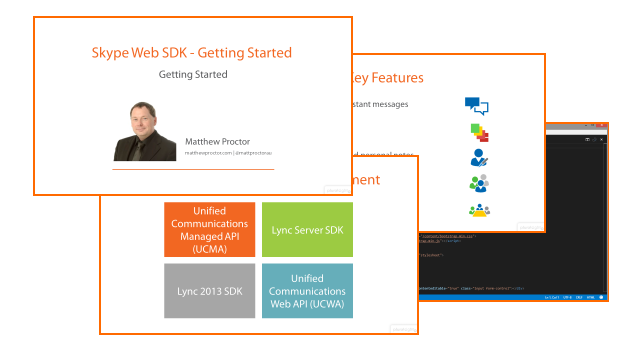 I've recently published a Pluralsight course on the new Skype Web SDK, how to start developing web applications with it, and some of the features it enables such as Instant Messaging and more. Building a Pluralsight course was harder than I imagined, but still very enjoyable, so I hope you learn a little from it. Click here if you'd like to learn about how I built this course. An overview of the SDK, the object model, and how to initialize and connect to a Lync 2013 or Skype for Business server using the SDK. Being able to retrieve and display your own information, both set by your administrator and those generated by your online service is an important step when building applications. When building a Skype-enabled web application, it can be useful to manage your presence and location settings - especially for scenarios where you are creating conversations or conferences and need to change and display your availability. Download a list of your contacts, retrieve their details, and start a conversations with them individually or as a group! Surprisingly more difficult, but obvious once you see how it works, is the process of handing return IM's from your conversation.